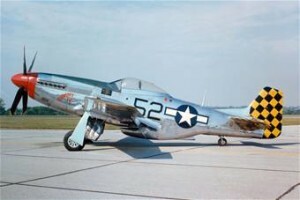 On September 4, 1951, two F-51D Mustang fighter planes, (A.K.A P-51), took off from Dow Air Force Base in Bangor, Maine, for a navigational training flight. Both aircraft were assigned to the 173rd Fighter Squadron of the 132nd Fighter-Bomber Wing. One aircraft, (Ser. No. 44-72724), was piloted by Lt. Donald W. Stewart, Jr., 27; and the second aircraft, (Ser. No. 45-11383), was piloted by Lt. Bernard L. Packett, 26. At about 4:15 p.m., while both aircraft were passing over the Portsmouth, New Hampshire, area, they were involved in a minor mid-air collision. A radio conversation between the pilots discussing the situation was picked up by the radio operator at the Salem, Massachusetts, Coast Guard Station. Lt. Stewart’s aircraft was more seriously damaged than that of Lt. Packett’s, and he was having trouble maintaining control. The Salem operator immediately notified the station’s commanding officer. Lt. Steward was instructed to head for Logan International Airport in Boston, where emergency crews would be standing by, but when he arrived over the area of Newbury, Massachusetts, a town north of Boston, he radioed that he was having a greater difficulty maintaining altitude and control. A Coast Guard rescue helicopter was dispatched with two men aboard: the pilot, Lt. Clarence R. Easter, and a crewman, Eugene J. Batkiewicz. Lt. Stewart bailed out at 7,000 feet while over the area of Plum Island, in Newbury. The parachute opened successfully, and he came down in the cold water a few hundred feet from shore. The rescue helicopter was equipped with pontoons for a water landing. Lt. Easter, seeing the parachute atop the surface, landed the helicopter on the water next to it, and dove in to assist Lt. Stewart who hadn’t surfaced. Both he and Bathkiewicz managed to pull the unconscious Stewart aboard the chopper, and then raced to the Merrimac River Coast Guard station at the northern end of Plum Island. There, doctors were unsuccessful in their attempts to revive Lt. Stewart, and pronounced him dead about forty-five minutes later. Lt. Stewart’s aircraft crashed into a sandy area of the Parker River National Wildlife Refuge on Plum Island where it exploded and burned. Lt. Packett was able to successfully fly his aircraft back to Dow AFB. Lt. Stewart was a 1946 graduate of West Point, and was survived by his wife and two children. He’s buried in Lincoln Memorial Park, Lincoln, Nebraska. To see a photo of his grave go to www.findagrave.com, memorial # 95846596.